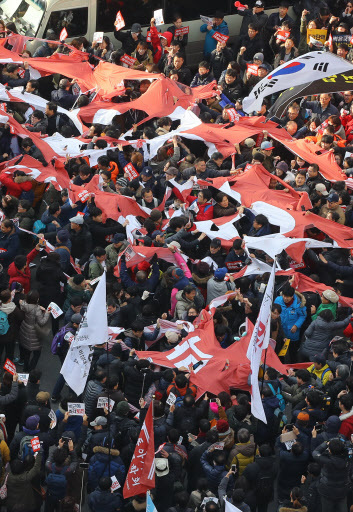 Up to 2.3 million people took to the streets across the nation on Saturday in their sixth consecutive weekend rally, to demand the President Park Geun-hye‘s resignation over an influence-peddling and corruption scandal. If organizers’ figures are correct, the rally is the biggest in the nation’s history, estimated at more than double the size of that in June 1987, when about a million people poured onto the streets to fight for democracy. The record-breaking crowds are a sign of continued public anger toward President Park, who refused to step down immediately, as well as the political parties that have so far failed to remove her from office. As of 8:30 p.m., an estimated 1.6 million protesters, according to rally organizers, packed the main boulevards connecting City Hall and Gwanghamun Square to Gyeongbok Palace in central Seoul for a candlelight vigil to ramp up pressure on Park to immediately step down. 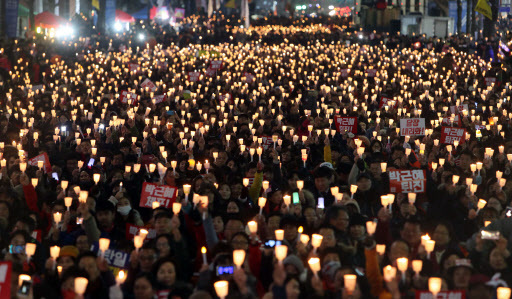 A total of 620,000 South Koreans gathered for candlelight vigils in other parts of the country, with 200,000 in the nation’s second-biggest city Busan and 100,000 in the liberal stronghold of Gwangju, according to figures from organizing groups. The protestors chanted “Park Geun-hye, step down immediately. It is the public’s order” and “Arrest Park Geun-hye” while holding up their candles. On Tuesday, Park issued an apology for the third time but said she would not step down immediately, saying she would leave it up to the National Assembly to decide when and how she should leave her post. “I think Park’s third televised address was a sophisticated political ploy. Now, the public fury, which was directed at President Park and her confidante Choi Soon-sil, spreads to the National Assembly,” Seo Young-soo, 23, said. There were 416 torches to symbolize the date of the Sewol ferry disaster, which left more than 300 people missing or dead on April 16, 2014. This came amid escalating controversy over the whereabouts of President Park for seven hours at the time of the sinking of the ferry. This is the sixth week of major protests against the president, who is suspected of extorting donations from conglomerates and allowing her civilian friend Choi Soon-sil to meddle in state affairs. Choi, who holds no government post, is alleged to have meddled in state affairs, used her influence to get her daughter Chung Yoo-ra accepted into a prestigious university and pressured companies into donating to funds to foundations she controls for her personal use. 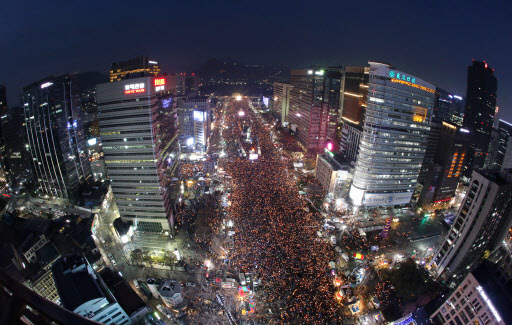 Police put the tally at 320,000 as of 7:10 p.m. in Seoul and 104,000 across the nation. Before the main event began at 6 p.m., some 500,000 protesters marched toward the presidential office. For the first time in recent history, protestors were allowed to march up to 100 meters from the presidential office by 5:30 p.m., the closest spot from Cheong Wa Dae, upon a local court’s order. A local court has ruled against police trying to block protesters from marching near the presidential office, citing freedom of public assemblies. Last Saturday, the court allowed protesters to hold a rally in front of Cheongwoon-dong community center, some 200 meters away from the presidential office. 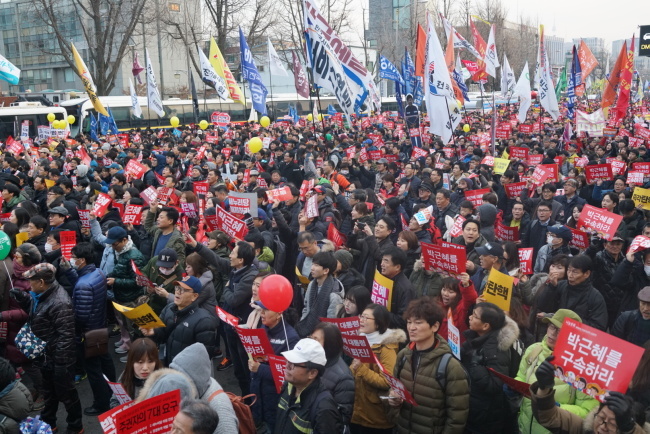 Showing the public anger directed at lawmakers opposing Park’s impeachment, protesters held a rally in front of the Saenuri Party headquarters in Yeouido, southwestern Seoul, Organizers said 20,000 people took part but police put the number at 1,000. “The Saenuri Party is an accomplice to President Park’s crimes. Ignoring the public’s voices, she is clinging on to power. She should step down right now,” said Park Jae-young, 29, in front of the Saenuri Party headquarters. On Friday, the initial plan among the main opposition parties and anti-Park group within the Saenuri Party to vote for an impeachment motion against Park fell through. The opposition parties agreed to hold a vote on the impeachment next Friday. Some protestors threw eggs at the banner on the building reading “Dear Koreans, we are really sorry. We will get the state affairs back on track as soon as possible.” They tore apart part a flag of the Saenuri Party in front of its head office. On the other side of Seoul, some 15,000 loyal supporters of President Park staged a rally in front of Dongdaemun Design Plaza, denouncing anti-Park protestors as “witch-hunting” the president. The police tally of attendance was 1,500. President Park Geun-hye’s approval rating remained at a record-low 4 percent this week, a Gallup Korea poll showed Friday, while 91 percent disapproved of her. A website that helps online users file a petition to lawmakers in their neighborhoods to demand President Park Geun-hye’s resignation, emerged on Saturday. As of 9 p.m., it collected some 450,000 signatures. So far, the cumulative number of Koreans who took to the streets to demand President Park step down has exceeded 6 million, according to rally organizers. Last Saturday alone, up to 1.9 million people participated in the rally, with 1.5 million gathering in Seoul.